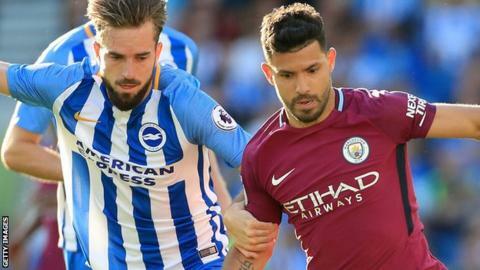 Title favourites City had to wait to break down the Seagulls before two late goals gave them victory on the south coast. But they never looked in serious danger of suffering an opening weekend upset in the manner of Chelsea, who lost at home to Burnley, or Liverpool, who were held by Watford. "The first game is always complicated, in my experience, even with Barcelona - especially against a promoted side when they have the passion and are under no pressure at all," said the former Barca and Bayern Munich boss. "We saw what happened to Liverpool and Chelsea and we spoke about it. It was unexpected but this is the Premier League - I learned this last season. "Here every game is a battle, but we controlled the game and it was always in our hands." The Seagulls, back in the top flight after a 34-year absence, had showed impressive organisation and resolve to keep City at bay until David Silva played in Sergio Aguero to fire home after 70 minutes. Lewis Dunk headed Fernandinho's cross into his own net five minutes later to make sure of the points for Guardiola's new-look side. Brighton, who had 22% possession, spent most of the game defending in their own half but had chances with the score at 0-0. Shane Duffy had a shot deflected just wide and, after City's new £35m goalkeeper Ederson flapped at the resulting corner, Dunk had two shots blocked in quick succession. But that was the only time City's defence was under pressure and the day was more of a test of whether Guardiola's rebooted team could break down a massed defence. They did not do it enough in his first season at City but at the Amex Stadium, eventually, they found a way through. New personnel meant a change to a 3-1-4-2 formation for Guardiola, something he tried during his side's recent tour of the United States. It was hard to gauge an accurate impression of City's new shape because Brighton sat so deep in their own half and saw so little of the ball. Even so, the signs are that City are still adjusting to it themselves. Kyle Walker and Danilo, signed for a combined £68m over the summer, did exactly what they were supposed to do as wing-backs - constantly getting forward and overlapping down the outside. All too often, though, their runs were ignored and City played the ball inside, where space was limited, before attacks broke down. Width was the way forward for City, however, and moves along the right flank provided both their goals. Dale Stephens' mistake allowed Walker to start the attack that led to Aguero scoring, while Fernandinho provided the cross that Dunk put into his own net. A rousing atmosphere greeted the Brighton players at a packed stadium but Chris Hughton's side, which included five new signings, had little opportunity to show what they could do. It was just their discipline and work-rate on show for the first hour or so, when they often had 10 men behind the ball. Up front, Tomer Hemed and Pascal Gross had a thankless task of chasing and harrying, without a sight of goal. That second-half spell, when City wobbled but held out under pressure, brought an amazing response from the home fans and perhaps demonstrated what might have been possible had Brighton showed more ambition on their big day against a side playing a new system. Chris Hughton's cautious approach came within 20 minutes of earning a point against a team with much greater talent and resources but could not quite get the job done - in the end, it was City who did that. "For 70 minutes we played the game we had to play when you are up against the quality they have got," said Hughton. "City have got designs on winning the Champions League - our target is to make sure we are in this division next season. "For 70 minutes, we kept them to minimal good chances but probably the first moment we allowed ourselves to get really stretched as a team, they capitalised." Manchester City's striker fluffed his lines badly with the score at 0-0, shanking a shot wide after Duffy's under-hit back-pass played him in, but he made no mistake with his next clear sight of goal to break the deadlock. Aguero, who scored 33 times last season in what was a difficult campaign for him, is off the mark quickly. Manchester City have won each of their last seven opening day contests in the Premier League, the best current run in the competition. Brighton have won just one of their last six opening league fixtures (D1 L4). Sergio Aguero has hit six goals in his seven opening day Premier League games. Lewis Dunk is the seventh player to score an own-goal on his Premier League debut. Since his Premier League debut in August 2010, David Silva has provided 65 assists in the competition, 14 more than any other player (Wayne Rooney is next on 51). Brighton & Hove Albion have scored just one goal in total in their last four league games. Goalkeeper Mat Ryan attempted more passes than any outfield Brighton player in this match (27). Manchester City have failed to find the net in just one of their last 12 Premier League games, netting 29 in total in that run. Man City boss Pep Guardiola: "We had chances in the first minutes. We have controlled the counter-attacks and we didn't concede one chance. We are going to improve the way we attack. "I was very happy with the new players. I want to say thank you to the club. We have huge players with lots of talent. Big congratulations to all the people in Manchester City - we are a strong club. Brighton manager Chris Hughton: "It is disappointing but that is the quality Manchester City have got and we know that. "We can take a lot of positives from the game. When you are playing Champions League-quality teams, you know that they can hurt you. It was always going to be difficult for us to score. "We have to make sure that come the end of the window, we have a squad that can do well enough in this division. We have to win the games that we can do. "The fans have been absolutely brilliant in my time here and I think they are realistic. They will certainly be behind us. It is a wonderful place to be and a wonderful place to play." Brighton are away at Leicester next Saturday (15:00 BST) then go to Watford the following weekend. Their next home league game is not until 9 September, when West Brom are the visitors. City's first home game of the new season is against Everton on Monday 21 August (20:00) before they return to the south coast to play Bournemouth the following weekend. Match ends, Brighton and Hove Albion 0, Manchester City 2. Second Half ends, Brighton and Hove Albion 0, Manchester City 2. Corner, Manchester City. Conceded by Markus Suttner. Substitution, Manchester City. Bernardo Silva replaces Sergio Agüero. Corner, Brighton and Hove Albion. Conceded by Fernandinho. Substitution, Manchester City. Raheem Sterling replaces Gabriel Jesus. Offside, Brighton and Hove Albion. Bruno tries a through ball, but Pascal Groß is caught offside. Own Goal by Lewis Dunk, Brighton and Hove Albion. Brighton and Hove Albion 0, Manchester City 2. Corner, Manchester City. Conceded by Solly March. Goal! Brighton and Hove Albion 0, Manchester City 1. Sergio Agüero (Manchester City) right footed shot from the right side of the box to the bottom left corner. Assisted by David Silva with a through ball. Substitution, Manchester City. Leroy Sané replaces Danilo. Corner, Manchester City. Conceded by Lewis Dunk. Corner, Manchester City. Conceded by Davy Pröpper. Attempt missed. Davy Pröpper (Brighton and Hove Albion) right footed shot from outside the box is close, but misses to the left following a corner. Attempt blocked. Lewis Dunk (Brighton and Hove Albion) left footed shot from the centre of the box is blocked. Attempt saved. Lewis Dunk (Brighton and Hove Albion) right footed shot from the centre of the box is saved in the centre of the goal. Corner, Brighton and Hove Albion. Conceded by Vincent Kompany.